Burslem, England, is about 15 miles south of Manchester, and not far from Stoke-on-Trent. The area is replete with potteries, mines, and canals. It is in Burslem that catcher and sometimes first baseman Alfred Louis Shaw was born on May 22, 1873 or 1874.1 Researcher Liz Cooper of the Stoke-on-Trent Archives was unable to find his recorded birth on that date, but did find a birth registered in 1874 of Alfred Shaw (with no middle name) in the Wolstanton district, subdistrict Burslem. The UK Census of 1871 had passed, and if Alfred had indeed come to the United States in 1880, as stated in the 1900 US census, it would explain why he was not found overseas in the 1881 census. In any event, Alfred came to America and, like many young immigrant men, played baseball. 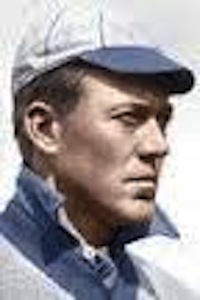 He worked as a potter in his early years.2 His first taste of professional baseball “as traced by official scorer Gruber dates back to 1892, when Frank Torreyson tried him at third for the Pittsburg State League team, which only lasted a few months. He played a good game.”3 Shaw was living at East Liverpool, Ohio, at the time. Jim Holl reports that his older brother Arthur played for Eclipse team in East Liverpool in 1891. The team won the pennant, but apparently by relying on other players. Even contemporary accounts say Shaw dropped out of sight in 1893 and 1894, but he reappeared playing for two Twin Cities teams in 1895. The “twin cities” were Denison and Ulrichsville, Ohio, the latter being where Shaw lived for the next 60-plus years. It was a strange season. The Twin City Twins won the pennant in the Inter-State League with a 38-22 record, but it was a season truncated by the deterioration of various franchises: Canton disbanded on June 2; the Lima team transferred to Mansfield and then disbanded on July 14; and the Steubenville team transferred to Akron on May 10, only to transfer again to Lima, and then finally disband on July 15 — when the whole league called it quits. The Twin City team — still managed by Jack Darrah — joined another league, the independent Iron and Oil League, in midseason (on July 16) — and finished in last place (7-21) in that circuit. Manager Al Buckenberger led the Stars to the Eastern League flag, by 3½ games over second-place Toronto. The two teams faced off in a postseason playoff for the Steinert Cup, but with the series tied at three games apiece, the teams couldn’t agree on where the final game would be played and the disagreement was so intense that the Steinert Cup Series was canceled — forever.7 Shaw led all catchers in the league with a .976 fielding percentage. Neither team placed first or second in 1898. Shaw was to join Pittsburgh but was so badly injured — accidentally spiked by Wally Taylor — in a Fall 1897 game that it didn’t heal over the wintertime and he needed an operation in May 1898, and missed almost a full year. Pittsburgh apparently cut the string it held on Shaw, and he appeared in only 23 games for the Stars, batting .195. He’d hit .257 in ’97. Shaw signed with the Detroit Tigers of Ban Johnson’s Western League in 1899, managed by George Stallings. He suffered a broken finger in May. Unable to catch as effectively, he worked a number of games at shortstop. At the end of the year, he was laid up with rheumatism. Johnson reconstituted his league as the American League in 1900, and the Tigers, Stallings, and Shaw all worked together again — Shaw playing in 88 games and hitting .259. Shaw’s first game in major-league ball was against the Philadelphia Athletics on June 8, 1901. He played first base and was 1-for-3. On June 18 he hit the only home run of his big-league career, a solo homer off Bill Carrick in Washington. In 55 games he drove in 23 runs, batting .269 with an on-base percentage of .321. George Stallings managed the Buffalo Bisons (Eastern League) all three years and “Shaw was given to Stallings by Detroit.”9 Shaw played for Buffalo (and Stallings) from 1902 through 1904. The Bisons took the pennant in 1904. There had been a little excitement for Shaw earlier in the season, on July 24 in Buffalo. It was a Sunday, the Bisons were to play Jersey City, and deputy sheriffs showed up to enforce the prohibition against Sunday baseball. Jersey City decided not to play, but the Bisons began to play a game against an amateur team until the sheriffs stepped in and arrested Shaw and one of the players from the amateur nine.10 How the case turned out, we do not know. Shaw hit .250, .247, and .260 in his three years with Buffalo. In 1905, he initially signed with a club in an “outlaw” league but jumped his contract when he had the opportunity to play for the Louisville Colonels. He appeared in 105 games, batting .268, but had another odd incident at the end of August — on the 31st he was one of nine Louisville players injured in a trolley accident in Kansas City. The players joined in a suit for damages against the Metropolitan Street Railway Company, claiming sums ranging from $1,500 to $7,500. Shaw’s claim was for $4,500. A week and a half later, on September 10, owner John I. Taylor of the Boston Americans announced a number of players whose contracts he had bought outright from other teams; one of them was Shaw. Coming off a disastrous 1906 season, which saw them finish dead last with a 49-105 record, and 45½ games out of first place, the Boston Americans had not one, not two, but five managers in 1907. Chick Stahl committed suicide during spring training. Cy Young managed the first six games of the regular season before he was replaced by George Huff, who lasted for eight games. Bob Unglaub took over next, for 29 games before the team finally settled on Jim “Deacon” McGuire. Shaw made the team during spring training at Little Rock, beating out Bob Peterson and joining Lou Criger and Charlie Armbruster. In a postseason post-mortem, Boston sportswriter Jacob Morse wrote, “Al Shaw certainly did good work behind the bat, his backstopping and throwing being up to the mark.”12 The offense was lacking, though, with an average of .192, only four extra-base hits, and only seven RBIs in 76 games. Though Criger broke his hand on September 20, the team didn’t see Shaw in its plans. Indeed, there were a number of players Boston planned to shift. The first plan was to send Shaw to Toronto via waivers, but Charles Comiskey of the Chicago White Sox refused to waive claim. Boston began to dicker with Chicago and on the first business day of 1908, the deal was done. The Red Sox traded Shaw to the White Sox for catcher Eddie Eddie McFarland. One wonders about the Boston Globe’s parting note: “Alfred Shaw is a young player who showed promise last year.”13 Shaw was 34 years old. White Sox manager Fielder Jones signed Shaw for the 1908 season on February 18. Longtime veteran Billy Sullivan, who’d been with Chicago since 1901, was the primary catcher, playing in 137 games. Shaw was his main backup, appearing in 32 games, but batting only .082 and with just two runs batted in and not even one run scored. In late April 1909 Chicago sold Shaw’s contract to Mobile. He refused to go to a Southern team, however, and so arrangements were made to sell him to Indianapolis instead. He appeared in 22 games for the Indians, and hit .243, but he was released on August 7. When both Peaches Graham and Harry Smith were hurt in August, the Boston Nationals quickly arranged to secure the recently released Shaw. He appeared in 18 games for Boston, batting .098 — with one run scored and none batted in. In January 1910 Shaw signed with the Western League’s Wichita Jobbers. He played in 125 games and hit for a .290 average, the best year of his career to date. He played for Wichita/Pueblo in 1911 (the team relocated to Pueblo, Colorado, on May 22), batting .269 in 85 games. In April 1912, he was given his unconditional release. As far as we have been able to determine (Shaw has no player file at the National Baseball Hall of Fame), he did not play baseball in 1912. Shaw had left the game, and he pursued a number of jobs taking advantage of some of his talents. Just a few years later, during the First World War, he was working as a machine helper for a railroad company. In 1920, living in Mill, Ohio, he was employed as a machinist for the railroad, living with his wife, Clara (Haskins) Shaw, and their 24-year-old son, Ralph. Ten years later, the green thumb was ascendant. Shaw was living in Ulrichsville with Clara and Ralph. Al was a florist, operating his own shop. In 1940, still in Ulrichsville with Clara, he combined the two jobs, working as a boiler fireman in a greenhouse, the Twin City Greenhouse.His last position was as a mouldmaker for Hall China Co.
Shaw was widowed; Clara had died in 1948. He himself suffered a stroke on March 6, 1958, and died of chronic myocarditis in a long-term care facility on March 25 in Ulrichsville, survived by his son, Ralph. In addition to the sources noted in this biography, the author also accessed the Encyclopedia of Minor League Baseball, Retrosheet.org, and Baseball-Reference.com. Thanks to Liz Cooper and to Jim Holl. 1 The Ulrichsville Chronicle reports his birthdate as 1874 in its March 25, 1958 obituary of Shaw. 2 Jim Holl has provided photocopies of the 1892 East Liverpool City Directory. 3 Sporting Life, October 10, 1896. 5 Sporting Life, May 23, 1896. 6 Sporting Life, April 17, 1897. 7 Lloyd Johnson and Miles Wolff, editors, Encyclopedia of Minor League Baseball (Durham, North Carolina: Baseball America, 2007), 173. 8 Chicago Tribune, June 6, 1901. 9 Sporting Life, October 3, 1903. There were reports that Shaw had signed with Milwaukee before the season, but it was Buffalo where he played. 10 New York Times, July 25, 1904. 11 Sporting Life, September 15, 1906. 12 Sporting Life, October 26, 1907. 13 Boston Globe, January 3, 1908. 14 Sporting News, October 9, 1909, and December 25, 1909. 15 Sporting News, April 10, 1915.